Concrete Cylinder Pipe is designed and manufactured in accordance with AWWA Standard C303 and is normally supplied in standard diameters of 300 through 1500 mm and in laying lengths of 10 and 12.5 m for operating pressures up to 4000 kPa (variable as per diameter). Larger diameters, shorter lengths and designs for greater operating pressures can be produced. CCP is designed to resist internal hydrostatic pressure by both the steel cylinder and helically wound rod. Thus, the pipe can be custom designed to provide the exact amount of steel needed for pipeline operating conditions by selecting the optimum combination of steel cylinder thickness and rod diameter and spacing. This flexibility in design can result in substantial cost savings over the use of standard pipe classes. The structural integrity of CCP is greatly enhanced by the helically wound steel rod which interlocks the steel elements of the pipe and the cement-mortar lining and coating. This composite construction greatly increases the pipe's rigidity, beam strength and resistance to impact and vacuum. The self-centering steel bell and spigot joint sealed with a confined rubber ring and the long laying length permit CCP to be installed rapidly and economically. 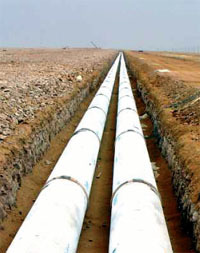 Laying rates of 30 to 50 pipe sections per day per crew are readily attained. The reliability of this joint sealed with a round rubber ring has been proved by 50 years of trouble-free performance. Ameron provides a complete engineering package for each CCP project, including pipe design data and fabrication details for each component. As part of a custom-designed system, each special component is numbered to identify its position in the pipeline. If required, layout drawings are prepared. Fittings ca be furnished in virtually any size or configuration and are manufactured in-plant to eliminate cutting and fit-up in the field. Most CCP fittings are fabricated from standard pipe sections; many are incorporated directly into the pipe, reducing the number of joints required, and thus speeding installation. Long-radius curves and minor changes in pipeline direction are achieved by joint deflection of standard pipe or by the use of pipe sections with ends beveled up to 5 degrees. 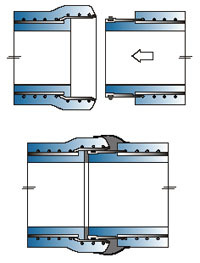 For shorter-radius curves, fabricated elbows are provided. Hydraulic thrust in the pipeline can be resisted by field welding the joint rings of assembled pipe sections on each side of the thrust point to develop the require longitudinal restraint, thus eliminating the need for expensive and sometimes unreliable concrete thrust blocks. The smooth surface of the cement-mortar lining provides a Hazen-Williams coefficient, C, of 145 for water service. Because cement mortar does not corrode, the carrying capacity is not decreased with age. The cement-mortar encasement maintains the steel elements in a highly alkaline environment (pH of 12.5 or greater) in which galvanic corrosion is permanently inhibited. As a supplemental protection all pipe and fittings are coated with coal-tar epoxy. CCP can be easily tapped, permitting the installation of a full range of outlets in any diameter pipe. When equipment is commercially available, pressure taps can be made without interrupting service.